On December 28, 2010, Police Officer Jillian Smith of the Arlington, Texas, Police Department was shot and killed while heroically saving the life of an 11-year-old girl by placing herself between the girl and a gunman bent on murder. Officer Smith was not only the last officer to be killed in 2010, she was also the sixth female officer killed last year. Just three days later, on New Year's Day, we suffered the very first line of duty death of the year. And again, a fearless female officer was the victim of a crazed gunman who ambushed her. Deputy Suzanne Hopper of the Clark County, Ohio, Sheriff's Office was fatally shot as she took photos of what was believed to be vandalism of a trailer. In all of 2010, only six female officers were killed in the line of duty, just 4% of the 160 total deaths. 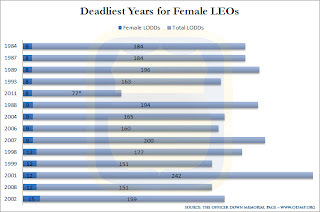 So far in 2011, a total of eight - yes, eight - female officers have been killed in the line of duty, which puts the year on track to more than double the total from 2010. This year, female officers account for 10% of all line of duty deaths. 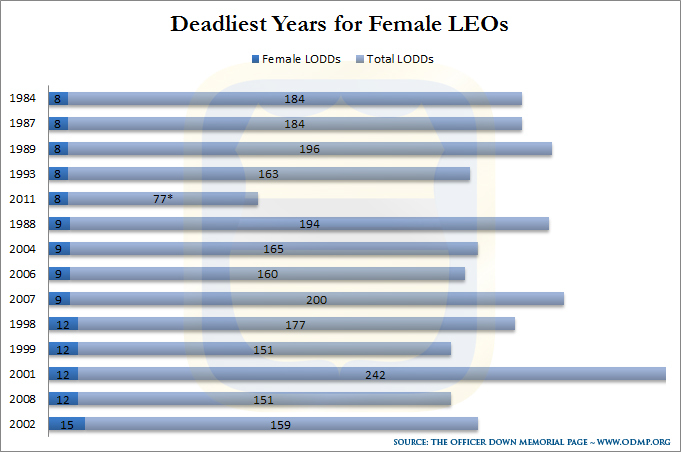 Percentage wise, it is the deadliest year EVER for female officers and, at the current pace, is on track to be the deadliest by total numbers as well. * 2011 numbers are through June 1st. Click on the chart to enlarge. "Even though the number of women in law enforcement is not necessarily increasing, the profession is becoming more deadly for us because it is becoming more deadly for all of us. Criminals are more willing to shoot a cop, assault an officer or drive drunk and crash into us. Women rarely succumb to LOD heart attacks, and we tend to be better at mitigating risk, but we're also out there, day after day, standing beside our brothers, willing to sacrifice." Betsy's comment drives the point home. Regardless if you're a male or female crime fighter; a police officer or deputy sheriff; a full time, part time or reserve LEO: You must be safe out there because the dangers are increasing. It is a shame that the count is up right now, but it is for all LEOs. Every time I read about a death of an Officer that has died in the line of duty, it reminds me. I could be next. It was a well written article and thanks for sharing it with us. RIP my Brother and Sisters in the Blues, for you are the silent Heros.